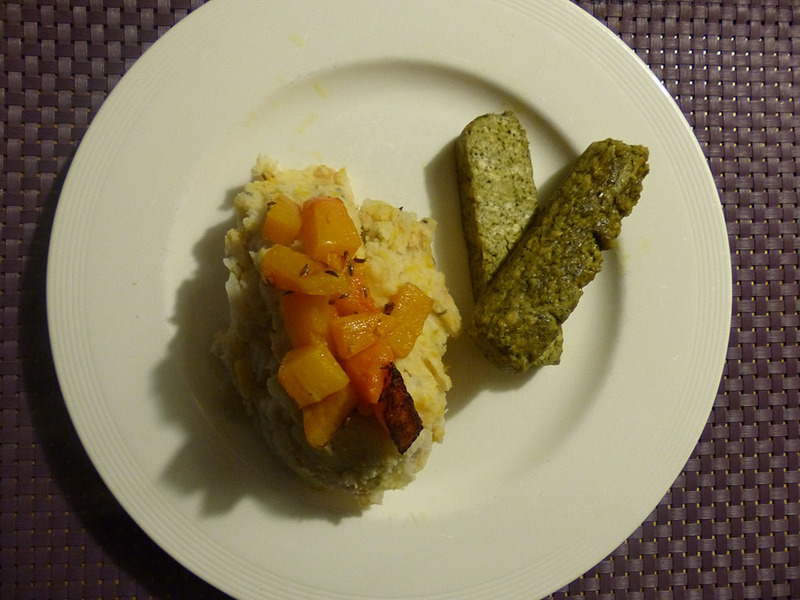 (Hutspot), raw endive or lettuce and potato mash (andijviestamp) or curly kale with mashed potato (boerenkoolstamp). Remove the skin of the pumpkin and cut the flesh into cubes of around 2cm squared. Put in a baking tray and cover with 2tbsp olive oil and the caraway seeds. Bake in the oven at 200C for around 25 minutes (or until soft). Peel and cut the potatoes. Cook the potatoes until soft. Mash the potatoes (this is the Dutch part!) with the cream sheese, most of the chickpeas and most of the pumpkin until smooth. You can either do this with a potato masher or with a blender. Next, add the rest of the chickpeas and the remaining pumpkin. Heat the sausages or cubes of smoked tofu and serve with the mash (or stamppot as it’s known in Dutch). Note: you can choose different flavours of vegan cream cheese, the pepper/spring onion is just a suggestion. So is the vegan sausages, you could substitute those for vegan smoked tofu!